While the ad speaks for itself to some extent, I did want to highlight some other reasons why this is a good moment to join us. We’re now a Domain of One’s Own campus, with a pilot currently underway and a more formal rollout slated for the spring. With the help of a donor and some of our own money, we’ve been investigating emerging technologies such as 3D printing (available to the campus for free), virtual reality machines, and drones. One of the instructional technologists has been leading a working group to get a policy approved for the campus, and has helped kick-start a student drone club. The college has just added a digital scholarship coordinator, Christina Boyles, and is building a Digital Scholarship Studio, which will come online in January. This will add two learning spaces, a recording studio, an imaging room, and a couple of meeting rooms to the usable space of the library. 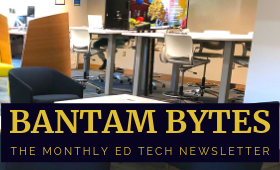 Educational Technology is housed in a newly-redesigned space that supports collaborative student work as well as innovative technological pedagogy. We’re doing a lot of cool projects–we were part of the #prmapathon for Puerto Rico a couple of weeks back, and are launching a physical computing working group this fall. We support a portfolio program that we expect to grow over the next couple of years. We develop courses for edX, and have some more very exciting courses in the pipeline. Instructional technologists have freedom to teach, both in the form of workshops but also in Trinity’s J-Term program (one instructional technologist, Cheryl Cape, is team-teaching a course on modeling financial data in our Bloomberg lab; the other, Dave Tatem, is team-teaching a course on drones and mapping) and interdisciplinary courses in research methods. I take professional development seriously as a manager, and send people to conferences and help them make presentations and publish articles. Over the past couple of years, we have laid the groundwork for some major developments in educational technology and digital scholarship, and they are starting to bear fruit. We welcome applications for the position, ideally before Thanksgiving; in the meantime, if I can provide any helpful information about Trinity or about our group, please don’t hesitate to be in touch! *The person who’s leaving is going to an instructional design job at a startup in Brooklyn.